The Hout Bay Hideaway is a small luxury retreat nestled in a lush garden amongst ancient yellow woods, palms, ferns, lemon trees, wild olives and proteas. 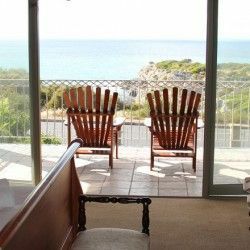 Overlooking the ocean, mountains and the historic Hout Bay fishing harbour, this one-of-a-kind, award-winning bed and breakfast accommodates a maximum of 9 guests. Elegantly styled with flair and attention to detail; genuine antiques, original paintings and cosy armchairs, these immaculate guest suites offer mountain and seaviews from the tall wood-framed windows and filtered sun veranda. 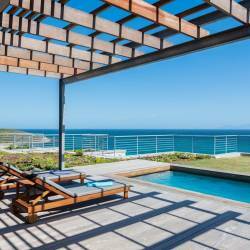 All guests have access to the rocks and grottoes of the wild, rambling garden, vine-cladded verandah, barbeque area, solar-heated saltwater swimming pool and sundecks. A Victorian bathtub positioned under the tree ferns in the garden, adds a memorable and unique touch to the many facilities on offer at this hideaway on the hills of Hout Bay. "For those who want the maximum of privacy and comfort with the minimum of fuss The Hout Bay Hideaway is a perfect choice".